This will be known as the week Warner Bros. pulls back the veil on the mysterious DC flick Aquaman. The studio is expected to unveil the first trailer for the movie later this week at Comic Con, but to build some hype it also released the first poster for the movie showing off the King of the Seven Seas in all of his underwater glory. Aquaman is being directed by James Wan and stars Jason Momoa as the titular character who rules the the underwater world. 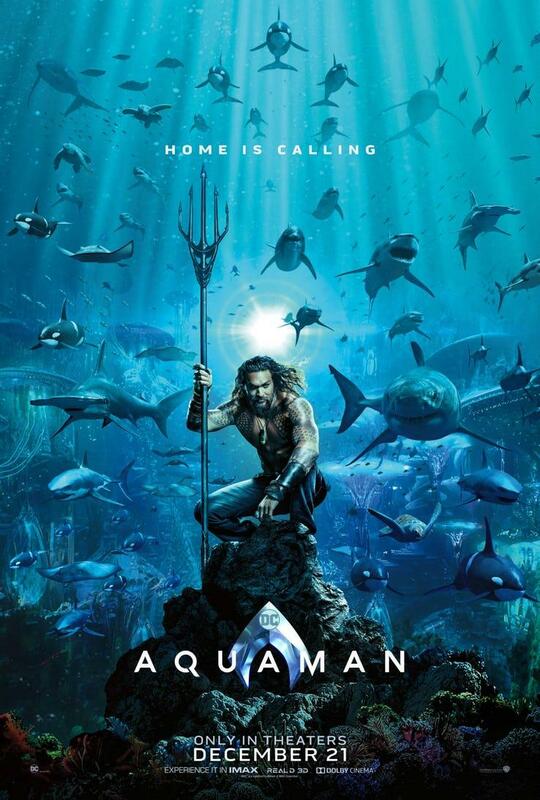 In the poster, released in a vertical and horizontal version, has Aquaman centerfold crouching on a rock with his spear (which isn’t his iconic Trident) in hand in an underwater backdrop riddled with various sea creatures. Aside from the visual imagery, the poster does little to give us details about the movie’s plot, though we imagine this is on purpose. However, the “Home Is Calling” tagline may provide some hints. Last we saw Aquaman in Justice League, he was in exile on land only making an appearance in Atlantis when Steppenwolf attacks to steal the Mother Box housed there. Eventually he is going to return to Atlantis to take up the throne as King of Atlantis.